2016 repress. "Brazil in the early 1970s had one of the vibrant music scenes in the world. Tropicalia was going strong, a challenge to both the music establishment and the state. Música Popular Brasileira (or MPB) was firmly established. Up in the northeastern corner of Brazil, centered in Recife, was another exciting strain of Brazilian culture called Udigrudi. 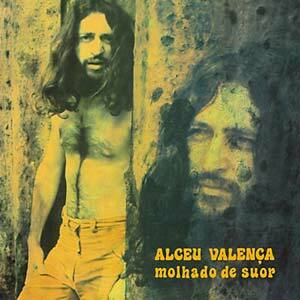 Lula Cortes, Ze Ramalho and Satwa were a few artists from the movement; but none is more celebrated than Alceu Valença. Valença grew up with the expectation of being a lawyer. He did go to law school, but he ditched the legal life for his first passion: music. In 1970, he played with Ave Sangria. Soon after he made a couple records with his friend, the artist and musician Geraldo Azevedo. However, his first solo album Molhado De Suor is what truly caused people to take notice. While other Udigrudi musicians melded traditional northeastern Brazilian music and rhythms with folk rock and psychedelia, it was Molhado De Suor that set the mark high. Aided by Lola Cortes and Geraldo Azevedo, Valença's rich vocals combine with driving guitar work, moody arrangements and unusual trips. Molhado De Suor is a record Slipcue calls innovative, insistent and vital. It is considered a Brazilian classic, often landing in Brazilian 'Best of All Time' lists and sought after by collectors. Molhado De Suor was originally released in 1974 on the Som Livre label and has never been reissued. Sol Re Sol is proud to bring this important album back in print."